I’ve known my friend, Joe, for about 9 months now. He’s a good guy, an ex-Marine, living in the Bay Area, who gushes about his kids given half a chance. He also has psycho-kinetic abilities and converses with some high level discarnate beings. You can tell when he gets angry, because you can sense a steely rage, but I’ve never seen him do anything but walk away from a fight. He called about 10 days ago, from AZ, where he was visiting his parents (his Mom had injured her foot, and Dad needed some help), frantic to know where his kids were. His wife, Helen, not American by birth, and with many ties still in her home country, had apparently just announced to him that she had left him, taken the kids, and refused to tell him where they were. It looked to me like they were fine, and still in the Bay Area, but clearly, this was going to be a very ugly divorce: Helen would do anything necessary to get what she wanted, including perjure herself, falsify evidence, steal from him, hide money, etc. I kept hearing to tell him that ‘this is the best thing that could have happened to you’. The next day he found an attorney, and asked about filing kidnapping charges. But it turned out that Helen had gotten a restraining order, which she hadn’t mentioned, based on a fight she and he had 8 years ago, which didn’t involve the kids. That makes her hiding the kids completely legal. She kept wanting to know when he’d be back at the house. He wondered if she were trying to trap him into violating a restraining order he’d never been served with. 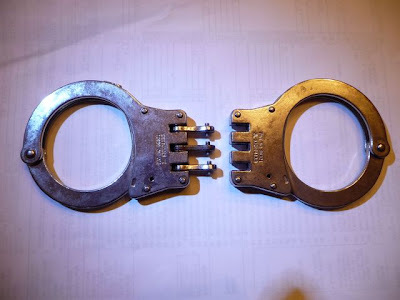 Obviously, these used to be handcuffs. I say ‘used to be’ because they are now in 2 separate pieces, and they can’t be put back together. You can tell from the photo (maybe not on the internet, but blown up, on my computer) that the serial numbers from both halves match. Joe swears that the last time he saw them, when he put them in the bottom of the file drawer he was cleaning out, they were in one piece. These cuffs are made so that those pins sticking out from the left side go into the slots on the right. The barbs on the pins (and the barbs and pins are machined out of one piece of metal) fit into little indentations you can’t see inside the slots. The barbed pins must be fitted into the slots of each side, and then the tops welded to the bottoms of each side, so there is no earthly way to get those suckers apart without major tampering. There are no signs of tampering. You can’t see any in the photo, and I examined them myself — not even a scratch. Clearly, no one on earth did this. Quite a manifestation! I take the message to be that he is free of her — or at least will be soon — and that all her shenanigans will lead to naught, that she won’t be able to entrap him. Since I’ve been under the weather for the last few days, I have my laptop set up on a bed tray, and have been reading and googling and writing from bed. It’s great — I recommend it highly. Last night, when I went to sleep, I put the bed tray down on the floor with the laptop on it, still on, still open, and with Photoshop in operation, as I’d begun to work on a photo of ocotillo I took in the desert a couple of weeks ago, absracting the ocotillo from the background to use in my art. The tool I was using was the magic wand tool, which selects areas based on (I think) color intensity. Caps lock was NOT on! My husband swears he never touched my computer, and I believe him, because we never touch each other’s computers without prior permission. My step son never comes in the bedroom when we’re asleep, so it wasn’t him. I can’t imagine that my cat could have done only this exact sort of typing — occasionally a cat will step on the computer, but cats kind of make a mess, long strings of one letter, that sort of thing. I don’t sleepwalk or anything; I know it wasn’t me. A couple of nights ago, I was at a friend’s home, a loft in downtown SF, with a few others, chatting about our businesses. I forget how it came up, but I told my friends some of the amazing things that have happened as a result of the mantra I sing internally (for other examples, click here, here and here). So I volunteered to do it briefly for them. So we sat in a circle and meditated, with me thinking the sounds of the mantra. After a while, I just felt like it was enough, so I stopped. We all opened our eyes, and the homeowner said, “Do you hear that?” Everyone else said yes immediately. It took me a moment to pay attention to the sounds around me, which I hadn’t been doing, because I’d been listening to the sounds in my mind. Wow! There were voices toning — it was beautiful, kind of like harmonious chanting. It lasted for 5 – 10 seconds and faded out. But then the toning started again a few minutes later. This went on, alternating toning and silence, for probably 45 minutes! The homeowner said there was no way it could be her neighbors, that in 8 years of living there, she’d never heard a sound from any of them, so that wasn’t it. One woman went up and down the hallway, trying to find the source, but she couldn’t find anything, either. So now I know that whatever I’m bringing through can not only heal people physically, but also manifest sound. I wonder what’s next? Our friends followed us home! When we were at the (somewhat grandly, but also aptly, named) Ambassador to the Universe training, Steve Greer kept telling us to ‘take some ETs home’ with us, and to try to contact them from home. He emphasized that we don’t need him, we can do this ourselves. Though I must say, at home, I don’t have 45 pairs of eyes to scan the sky, let alone a night scope. Hell, I don’t even have binoculars. I’ve never seen anything when I’ve been out with a small local group, either. So although I understood his point, I really wasn’t sure I’d ever be able to do it. On the way home from Mt. 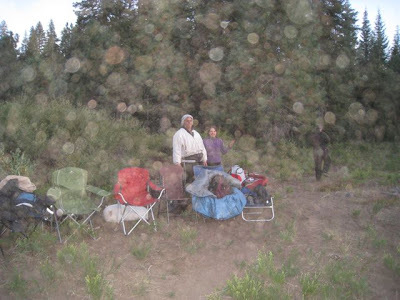 Shasta, Kosta and I were talking about what location to use to try to contact our star brothers and sisters. I kept saying that it would be pretty easy to do it from Pacifica, partly because of the coast and the hills and bluffs overlooking it, but also because it would be pretty easy to show them where to go, using our minds. I just thought about showing them San Francisco and then the coast slightly south of it. It was hot when we got home, so after unloading the car, Kosta and I went for a walk this evening on Linda Mar beach in Pacifica. We were walking north(ish) along the beach at about 7:10PM. It was still broad daylight, and the sun was probably 15 – 25 degrees above the horizon. I saw a bright white light about 15 degrees above the horizon, out over the Pacific, about 25 degrees north of where the sun was sinking. It occurred to me that this couldn’t be a star (it was in the west, and the sun hadn’t set yet), so I asked it to blink off and on to show me that it was really a craft. It waited a while, then slowly blinked out, and then slowly came back on, just as bright and in the same location! It stayed for a while, and then slowly blinked out again. The whole encounter was probably 3 minutes. We were so excited that we called a friend about half an hour later to tell her, and as we spoke, another appeared! It hung in the darkening western sky for a while, and again, I wasn’t sure what it was, so I asked it to blink off and on. It blinked off, slowly. I ‘got’ that “this materializing and dematerialzing is harder than you think”, because i was getting impatient, waiting for it to blink on again. It did eventually blink on again, though in a slightly more southerly location. It hung there in the sky, bright white. As we watched it, we both saw a second light blink on! Both hung there for a while, and then one began to move to the east. Eventually, that one began to have red blinks, kind of like a terrestrial aircraft, but not quite. It moved across the sky for a while and then disappeared. The other one was still hanging over the Pacific, but eventually, it, too, began to move east, and then to blink. It had now been 1 1/4 hours since we saw the first UFO, and we got in the car and went home.